Electrofishing is an effective way to sample freshwater fish populations. However, electrofishing may cause fish injury or mortality. 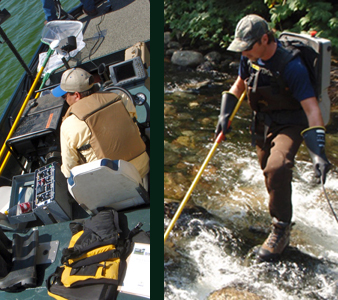 Proper balance between efficient sampling and minimal harm is achieved through the knowledge of electrofishing principles and proper use of the techniques and equipment available. This unique four-day course will cover the principles and practices for both boat and backpack electrofishing through two classroom days and two field days. Days 1 and 4 will be spent in the classroom, and days 2 and 3 will be spent in the field, during which the concepts discussed in class will be demonstrated and practiced by attendees. During the Backpack field trip, the class will visit a stream/river/creek and each attendee will operate the equipment under the guidance of the instructor. During the Boat portion of the course, the class will be taken on an electrofishing equipped craft, and each person will have the opportunity to practice using the boat-based electrofishing system. These two days of field exercises provide attendees with real-world experience applying the concepts discussed in the classroom. The combination of classroom lecture, field demonstration, and participation exercises gives attendees the knowledge and basic experience they will need to safely and effectively electrofish. Boat-Backpack Electrofishing: Principles and Practices is intended to meet the National Marine Fisheries Service (NMFS) training requirements for electrofishing field staff. The NMFS guidance and training requirements document may be downloaded here. You may register online or by calling the Northwest Environmental Training Center at 435-270-3274. Please wait to receive a course confirmation email, roughly one month prior to the class, before making any non-refundable travel arrangements. Reduced tuition is available for Native American tribes, government employees, nonprofits, students and AFS, NAEP, NEBC, TAEP members. This course is intended for biologist, field personnel, and other professionals seeking an improved understanding of the principles and techniques of electrofishing.